304 Marlborough is located on the south side of Marlborough, between Fairfield and Gloucester, with 302 Marlborough to the east and 306 Marlborough to the west. 304 Marlborough was designed by architect Frederic H. Moore and built in 1878 by Daniel Weeks Beckler, builder, and Michael Nolan, mason, one of five contiguous houses (302-304-306-308-310 Marlborough) built for speculative sale. Daniel Beckler is shown as the owner on the original building permit application for all five houses, dated January 2, 1878. It appears that he built the houses under an agreement with the Metropolitan Railroad Company (operators of a horse car system in Boston) which owned the land at the time he filed the permit application. While they were being built, the Metropolitan Railroad Company apparently entered into an agreement to sell the land to Harvey Jewell, one of the company’s directors, and he is shown as the owner (and Daniel Beckler as the former owner) on the final building inspection report dated December 23, 1878. The Metropolitan Railroad Company conveyed the land to Harvey Jewell on April 9, 1879. Daniel Beckler had built six contiguous houses across the street (309-311-313-315-317-319 Marlborough) between 1874 and 1877, also on land owned by Harvey Jewell. Harvey Jewell was a lawyer and former state legislator, who had served as Speaker of the Massachusetts House of Representatives from 1868 through 1872. He and his wife, Susan A. (Bradley) Jewell, lived at 204 Beacon. The Metropolitan Railroad Company purchased the land for 302-304-306-308-310 Marlborough in 1871: two 24 foot wide lots on February 16, 1871, from Franklin Evans, and two 24 foot wide lots on April 5, 1871, from Solomon H. Howe. Daniel Beckler built five houses on the land, each on a 19.2 foot lot. The land originally was part of one of several parcels purchased from the Boston Water Power Company on January 29, 1866, by a real estate investment trust formed by John Templeman Coolidge, Franklin Evans, and Charles Henry Parker. The trust subdivided the property into lots, which it sold to investors and builders, who then frequently resold the lots to others. Click here for an index to the deeds for 304 Marlborough. By the 1879-1880 winter season, 304 Marlborough was the home of wool merchant Henry Augustus Rice, Jr., and his wife, Grace (Tileston) Rice. They previously had lived in Dorchester. They continued to live at 304 Marlborough in 1882, but had moved to 16 West Cedar by 1883. Harvey Jewell had died in December of 1881, and on July 1, 1882, 304 Marlborough was purchased from his estate by Dr. Horace Dupee, a physician. He and his wife, Octavia Watts (Gardner) Dupee, made it their home. They previously had lived at 308 Marlborough. They continued to live at 304 Marlborough during the 1885-1886 season, but moved thereafter to Dorchester. On May 27, 1886, 304 Marlborough was purchased from Horace Dupee by Dr. Frank Winthrop Draper, a physician and professor of legal medicine at Harvard. He and his wife, Fanny (Jones) Draper, made it their home and he also maintained his medical office there. They previously had lived (and he had maintained his office) at 36 Worcester. Living with them at the time of the 1900 US Census were Fanny Draper’s mother, Catharine (Brigham) Jones, the widow of William H. Jones, and Elizabeth (Lizette) Louise (Shaw) Draper, the widow of Frank Draper’s nephew, James Herbert Draper, who had died in February of 1898. 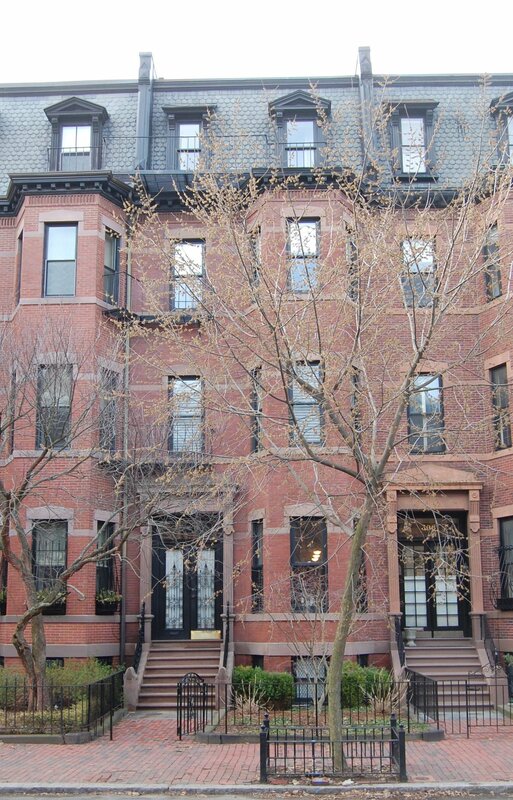 The Drapers continued to live at 304 Marlborough during the 1904-1905 season, but moved thereafter to Brookline. On March 15, 1905, 304 Marlborough was purchased from Frank Draper by Miss Annie Norton Ward. During the 1907-1908 winter season, Annie Norton Ward was traveling abroad and 304 Marlborough was the home of bond dealer Charles Wilson Taintor and his wife, Caroline Tileston (Hemenway) Taintor. 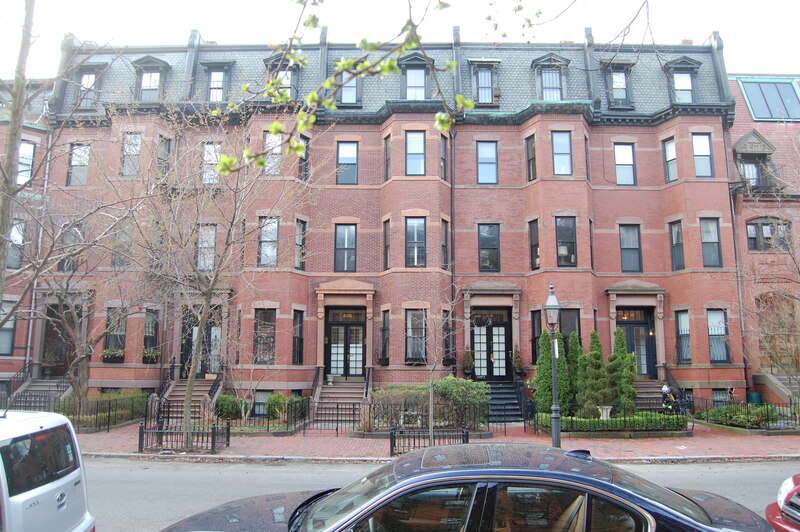 They previously had lived at 242 Beacon with her mother, Ellen (Tileston) Hemenway, the widow of Charles Porter Hemenway. 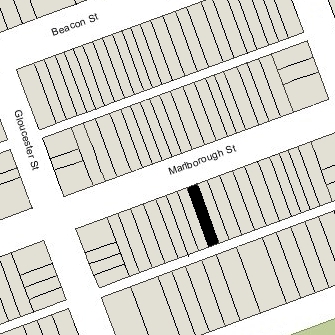 By the 1908-1909 season, the Taintors had moved to 149 Beacon and Miss Ward had resumed living at 304 Marlborough. In 1913, Miss Ward was joined at 304 Marlborough by John H. Thomas, manager of the Boston office of the White Star steamship line. He had lived at 375 Beacon in 1912, He had moved to an apartment at 199 Marlborough by 1914, and to 170 Marlborough by 1915. Annie Ward continued to live at 304 Marlborough during the 1917-1918 winter season, but moved thereafter (she died in August of 1919 in Greenfield, Massachusetts). During the 1918-1919 winter season, 304 Marlborough was the home of the Misses Andrew. During the 1919-1920 winter season, 304 Marlborough was the home of Homer Eugene Sawyer, Jr., a paper mill executive, and his wife Kathryn (Motley) Sawyer. By the 1920-1921 season, they had moved to 385 Marlborough. On June 24, 1920, 304 Marlborough was purchased from Annie Ward’s estate by Miss Hortense I. Porter. She was joined there by her sisters, Rosamond Porter and Edith (Porter) Musgrave, the widow of Percy Musgrave, and Mrs. Musgrave’s children: Eleanor, Rosamond, and Percy Musgrave. They all previously had lived in Brookline. Eleanor Musgrave married in June of 1925 to John Gardiner Flint and moved to Cambridge, Percy Musgrave, Jr., married in October of 1931 to Marguerite Swann and moved to 323 Beacon, and Rosamond Musgrave married in 1935 to John Rennselaer Van Nagell, a career Navel officer, and moved elsewhere. Edith Musgrave continued to live at 304 Marlborough with Hortense and Rosamond Porter until her death in mid-1939. 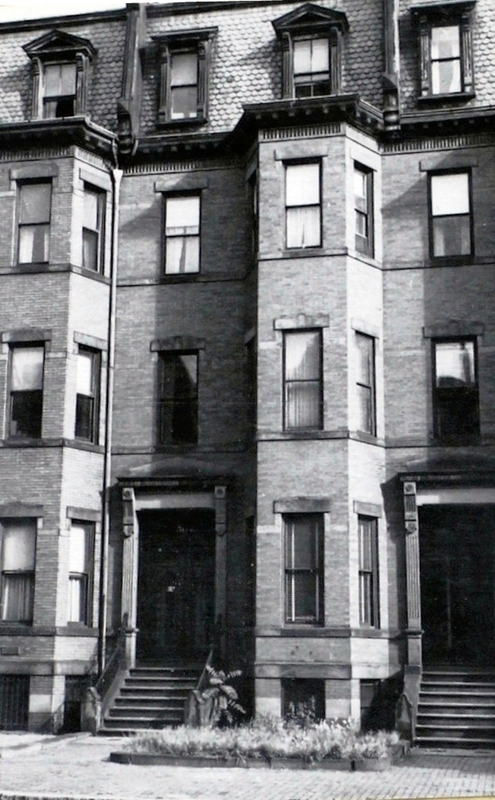 Hortense and Rosamond Porter continued to live at 304 Marlborough. By 1943, they had moved to an apartment at 269 Commonwealth. On August 21, 1942, 304 Marlborough was purchased from Hortense Porter by Josephine Virginia (Nardi) Gallucci, the wife of Francesco (Franco) Paolo Gallucci, an advertising agent. They operated it as a lodging house. They previously had lived at 105 Peterborough. The Galluccis continued to live at 304 Marlborough until about 1950. On June 14, 1950, 304 Marlborough was purchased from Josephine Gallucci by Charles William Pollock, a podiatrist, and his wife, Mildred G. (Sanborn) Pollock. They previously had lived in Waltham. He maintained his office at 304 Marlborough and they also operated in as lodging house. They continued to live there until about 1964. On May 1, 1964, 304 Marlborough was acquired from the Pollocks by Miss Madalean E. Dickinson, who operated it as a lodging house. She previously had lived at 392 Marlborough with her mother, Mabel (Haynes) Dickinson, the widow of Rankin Smith Dickinson, and her brother and sister-in-law, William Rankin Allanson Dickinson and Dorothy Ray (Bodman) Dickinson. On December 29, 1982, she transferred 1/13th interest in the property to her nephew, William R. Dickinson, and his wife, Barbara S. Dickinson. One week later, on January 6, 1983, she executed another deed, transferring the entire property to them. William and Barbara Dickinson continued to operate it as a lodging house until 1994. In August of 1995, they applied for (and subsequently received) permission to convert the property into a single-family dwelling. On March 24, 2003, 304 Marlborough was purchased from the Dickinsons by Tucker M. Walsh and his wife, Kathleen Walsh. In August of 2005, the Walshes entered into a “Preservation Restriction Agreement” with the National Architectural Trust for the purpose of ensuring preservation of 304 Marlborough’s exterior. 304 Marlborough subsequently changed hands. It remained a single-family dwelling in 2017.